Aleppo – Freunde der Altstadt von Aleppo e.V. Since about 5000 years, Syria is located in an area of tension between several regional and local powers. Throughout its history Aleppo has been destroyed and rebuilt several times. Since the start of the conflict in Syria the entire city with its inhabitants is exposed to violent conflict and fights. This has affected various neighborhoods and monuments. Aleppians struggle to maintain their livelihoods and survival or decided to leave their homes. Today all six cultural world heritage sites in Syria (Old City of Damascus, Old City of Bosra, Old City of Aleppo, Krak des Chevaliers and Qal’at Salah ed-Din), as well as the Dead Cities in the North of Syria are added to the Red List of endangered UNESCO Heritage Sites. 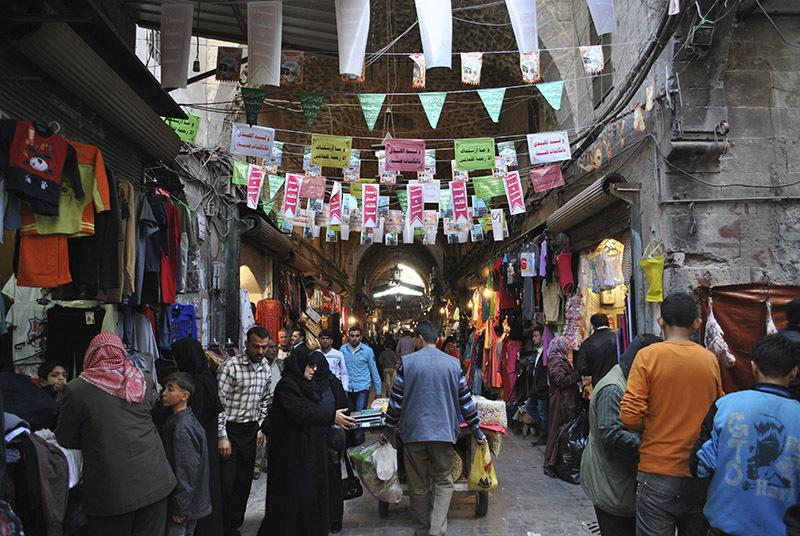 With the civil war in Syria and the battles for Aleppo, which are currently also taking place in the Old City, the destruction of the historical monuments, such as the Great Mosque, parts of the Souq market area, but especially of the different traditional residential areas, continues as well. Many historical documents are thus perhaps irrevocably lost and with them also hopes which were associated with the preservation and renewal of the Old City. A city culture that not only includes the historical monuments, but the language, the music, the crafts, and especially the lifestyle of the inhabitants, which was defined by the coexistence of different ethnic and religious groups, is being destroyed. Some aspects of this rich urban culture, but also images of the destruction will be shown in the example of the images of Aleppo. To understand why our association is committed to Aleppo’s urban, architectural and cultural heritage, and since the beginning of the armed combat with its reconstruction, this section will provide some insight into Aleppo. Thanks to the commitment of a number of local architects and other citizens, a process of safeguarding and rehabilitation started in 1994 with GIZ, ensuing in private initiatives, followed by academic research and involvement, eventually resulting in national and international rehabilitation projects to conserve this invaluable heritage, a legacy long threatened by the harsh transformations of the 20th century. Starting with a group of architects who were alarmed by the harsh interventions in the historic fabric, Aleppo’s society managed to successfully oppose municipal planning what peaked in the alarming destruction of a neighborhood near Bab Al-Faraj. In 1978, when the 1974-master-plan turned into its implementation phase, resistance was formed by local architects and ‘conservationists’, initiated by architects. 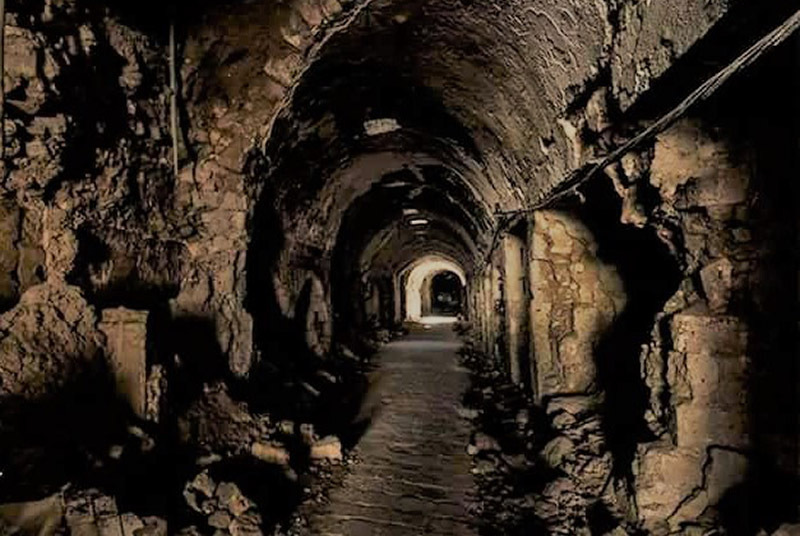 Consequently, an ‘Old City Committee’ was formed, consisting of members from the private sector and other public institutions to negotiate the future development of the Bab Al-Faraj site, and the old city as a whole. Historic Aleppo, a World Heritage Site sized about 360ha, looks back to more than a 5000 years old continuous urban history dating back to the third millennium BC. Outsiders and visitors have admired the city’s urban heritage ever since. Throughout the centuries, old city’s inhabitants pragmatically considered the ancient urban fabric and its architecture as home and economic platform.